slob wrote: Does anybody know any more on this? Do you have a source of that? Soviet agitprop made all kinds of outlandish claims about atrocities by the "Hitler Fascists". I think that also involved conveyor belts, electrocution, steaming, nuking and all kind of other partially idiotic execution methods. It's just that the gassing with Zyklon B and Diesel exhaust were the least dumb-sounding execution methods. 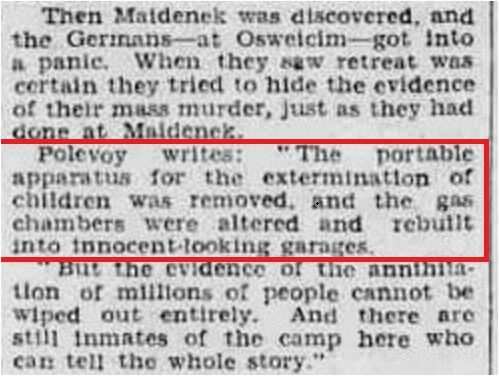 And they found Zyklon B cans plus there were rumors about homicidal gassings, which I believe may have been rather common. This is quite understandable since delousing gas chambers and showering were routine hygiene measures in the camps. 2 newspaper articles, one mentioning the altering of gas chambers and turning them into garages? Watching that video of the documentary, it says that from the 90's these "Stalag" books have been part of the Israeli school curriculum on the Holocaust, kids are being taught in school(brainwashed), that what is mentioned in these books actually happened and are true!